Oprah Winfrey was famously fired from a local TV station in Baltimore for being too emotional while reporting the news. J.K. Rowling, a divorced, single mom, was penniless when she wrote the first Harry Potter book. That book was rejected by 12 different publishers before it was finally published. Henry Ford may be an American icon today, but his earlier business ventures failed, leaving him broke five times before he founded the Ford Motor Company. Winston Churchill failed the sixth grade. He was later defeated in many political elections before becoming Prime Minister at 62. He went on to serve two terms and to win the Nobel Peace Prize. If you have failed at anything in life, you are in great company. Winfrey, Rowling, Ford and Churchill’s failures may have stopped some people from trying again. They experienced spirit-crushing defeats, however they pushed on until they succeeded. From the time we are young, we hear of the virtues of winning. We are pushed to win at all costs. We try to prevent our children from failing – in sports, in education, in life. There’s a lot more emphasis placed on winning, for obvious reasons, but losing creates some of our best learning experiences. Losing brings us one step closer to winning – for it indicates that we tried at something and are now informed as to what didn’t work. There’s honor in losing, when we’ve given it our best shot. The only dishonor is in not trying. The way we treat failing needs some upgrading. We are not failures because we’ve failed. When we commit to the process of doing whatever it is we are attempting, we need to realize that failing is a part of the deal. We can never know what works until we try. We will never know until we throw another dart at the board, and then another one, until we land right on the bull’s eye. Stay the race. Never give up. Failing is actually a good thing – if we can keep our pride and egos at bay. Failing keeps us humble and hungry and ready for success the next go around. 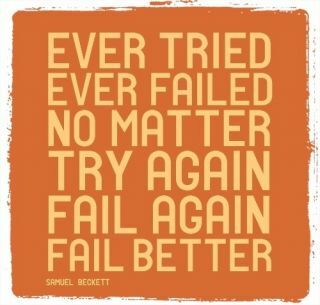 Keep trying is so true! Dawn … I always smile when I see a Women Who Hope post pop up. I know you are all sharing what life has taught (and is teaching) you … And you are doing it in such a powerful, positive, and, yes, courageous, manner. Brava!! Thanks for that affirmation, Ivette and for being so supportive! I also love your A Silver Latina on the Mat blog. I find each post to be refreshing! Keep up the great work! This should be a daily mantra! Sometimes we get so caught up in the weeds and weariness of life that we forget that every success story didn’t start out that way. Your goals may take way more time than you anticipated. But if you make it a point to enjoy the journey and keep pressing on, you’ll get there. Thanks for the perfectly timed reminder Dawn!